How do I activate my DNA kit? If you are logged out, please log in with your registered email address and password. Make sure you are logged in with the details of the account you purchased the kit from. 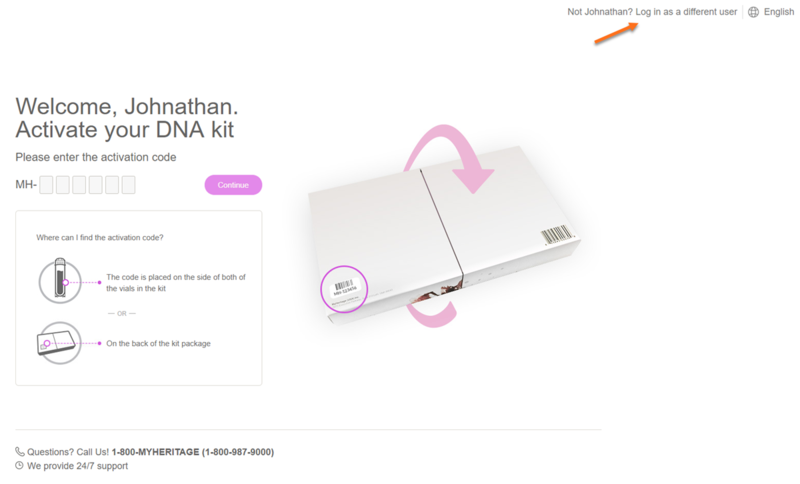 If you are not registered to MyHeritage and would like to activate a DNA kit that was purchased for you, click on ‘Sign up for free’ to register in a few simple steps before the activation of the kit. 1. Enter the activation code (the kit number) which you can find on the side of both vials or on the back of the kit package. Note: If you activate a DNA kit for someone else's DNA, make sure you select ‘Someone else’s'. Please read How do I activate a DNA kit purchased for a family member? for further instructions. 4. Make sure you read and accept the Service Terms and Consent Agreement and click on ‘Activate’ to activate the kit. If they are not registered to MyHeritage, they will be able to sign up before activating their kit. You may also activate their kit yourself and manage their DNA results from your MyHeritage account. Note that if you choose to do so, you will be required to receive their explicit permission. Please also note that the person who activates a DNA kit becomes the only DNA manager even if it was purchased by someone else. Re-assigning the kit doesn’t change the owner’s rights. You can also activate your MyHeritage DNA kit directly from the MyHeritage App, by simply scanning the activation code with your device's camera. To do so, open the app menu and select 'Activate DNA kit'.